EVE Forums » EVE Communication Center » EVE General Discussion » Next development cycle? No really..what is next? Apart from drilling platforms that have apparently been pushed back, what does CCP have in store for EvE? It seems things are awfully quiet for some time now. No exciting new dev blogs, nothing in the upcoming features section..
Where is the new stuff dev excitement? Where are the inspired dev blogs detailing awesome new features? Where are the things to be impatient for in the future?? Everything seems stagnant as is. Almost as the rumor of selling EvE is true, and everyone in CCP is in maintenance mode just waiting to see what will happen next. Either that or current devs have hit some sort of invisible wall of lost compass, no vision or any inspiration for where to take EvE next. Either way not good. I love EvE to death, but the development baloon just seems so deflated. The winter CSM summit runs January 30 - Feb 2. It is likely the roadmap will be discussed first with the CSM. There may be some devblogs between the summit and Fanfest but I'll be surprised if there are any major announcements before the Fanfest keynote. The developers still have a substantial backlog to get the stuff they gave us last year working properly. I hope they finish that work before releasing anything new. Well we just got Citadels so there's that. That was kind of a big deal. And incidentally, EVE seems a great deal less stagnant if you're living outside hi-sec, I can tell you. There's a bloc level war going on in the south, a regional conflict around the Fade-Syndicate axis, what is at least heavy skirmishing going on between XiX & co vs Project Mayhem & Snuff, plus I bet 2-3 other similar size campaigns happening that I just haven't noticed because I'm busy with the one I'm in and they don't get the upvotes on r/eve. The CSM summit is about to happen. CCP will be presenting the development focus for the next 6-12 months and getting feedback. Soon after that, the devblogs will start hitting. As per CCP Seagull's 'Grand Design' presented back in 2014, the overarching plan has been New Sov -> New Structures -> Corp & Alliance rework -> Player Built Stargates to "the new territories". You can see more or less where we are on that. I think it's a reasonable supposition that we'll see a big rework of how player organisations work by the end of Q2, and at least the opening phases, teasers and trailers of the new territories by the end of 2017. Incidentally, as far as I can recall from the conversations back when, the corp & alliance code was deemed the worst of the old spaghetti code, even worse than POS/outpost code, and the biggest project to refactor. Now that CCP have refactored just about all the adjoining code blocks, they can burn off the last head from the hydra. 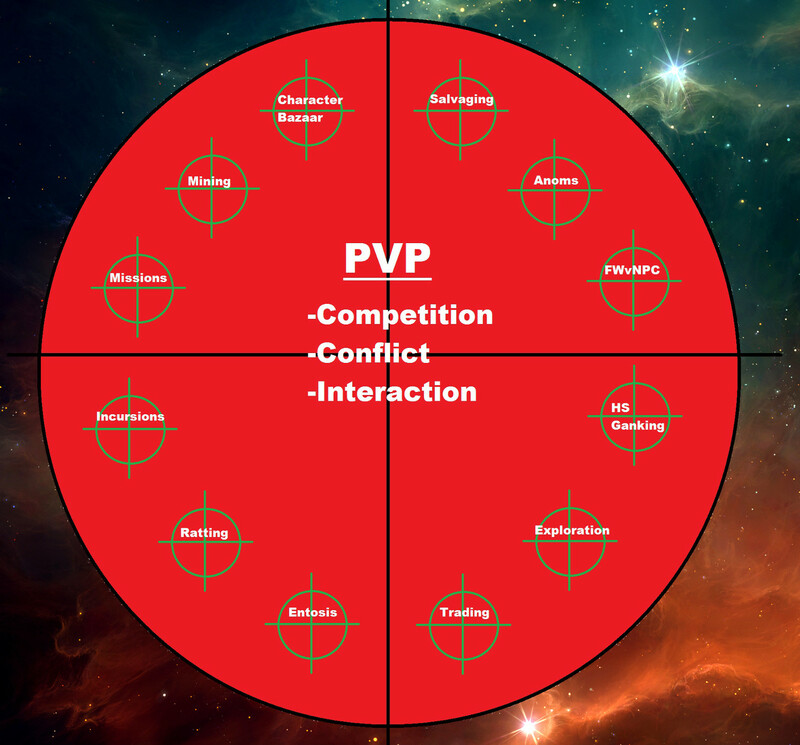 Think about how many things are affected by or affect corp/alliance code - everything from sov to structures to NPC standings to market taxes to docking rights, to god knows what else. When CCP have cleaned that mess up, they will be working from a more or less refactored codebase - properly structured and commented. The only big block left AFAIK will be the NPC code and as we've seen some changes in the way NPCs act already, it's possible they've at least made some progress there already. That removes a very big source of drag in developing new features and updating old elements. Coming up next, selling CCP to the highest bidder! T3 Drifter tech Battleships I see happening sometime in the future. Malc is actually Jita bot, I KNEW it! My money is on CCP being acquired. This post brought to you by CCP's alpha forum alt initiative. Playing the eve forums has never come cheaper. Two more words: Electronic Arts. Go to EVE Updates and you will see why this question got asked. Being in a situation where there is literally only a single thing on the roadmap and that is scheduled for six months away isn't a very good look for open information flow. Fanfest is certainly not a good time to be announcing the next developments as Fanfest is more than 2 months away at this point, and any announcement should be coming with enough time for players to Sisi test it, meaning anything announced at Fanfest is likely 4+ months away from going live. Nor is the CSM summit really relevant to the total dearth of information as again, they should be seeing stuff very early in the cycle so it will be 2+ months after they see it to go live if there is any testing done, and if there isn't there is no real need to give the CSM early warning of a feature that CCP aren't taking any feedback on. So yeah, the empty update calender does concern me. Was discussing this with someone today; and trying to be positive, I'm going with - the coming update is so big and so monumental, that CCP are keeping a really tight lid on it until it's ready to release. 2. The door in the CQ opens and this will be integrated into Citadels. But that's totally a rose coloured glasses view of CCP (and their ability to develop new gameplay) and just trying to stay positive about the really poor info on the roadmap. Not going to happen. I'm just an optimist. Im fine with 6 months of balance/fix/mechanics passes before the next big thing. My advice to CCP would be to also develop somekind of EVE integrated mini-game mobile app. They are missing out on a huge market. If they lack developers for it themselves, then perhaps setup a competition to outsource the effort whereby indy developers can try their hand at it, and the best is chosen for further development. Which part of Eve, did you think, translates well into a mobile game? All I can think of is the market and PI. If it had been possible to integrate the Discovery project into an EVE app, whereby you map the proteins on your mobile, and garner ingame benefit. As to PI, perhaps a simple grid/hex style mobile app that allows a player to optimise their planet bound structures output for a few % against AI changes. A market app, sure, why not, if its technically possible, although this one in particular might lead to less login numbers, which looks bad for population figures, as traders instead handle their business off their mobiles. A minigame where you can fractionally improve player standing with a specific Corp by completing Sudoku squares. A minigame of hacking that earns you LP with a new mobile app specific NPC faction. Taken to a simple extreme, winning 10 matches in a row of tic-tac-toe shaves 1 minute off a training skill. The benefit is tiny, but people will play it, guaranteed, I'm sure you will agree. Even a mini-game so simple and tedious as this would have thousands of players using it around the world, immediately on launch. Mobile apps also increasingly enable player competition in more or less realtime, or on a turn basis. The format of the minigame itself, and the rewards, are limited only by imagination and practicality. The point is that most EVE players are away from their PC for most of the time. During that time, when they have time, I think there is a strong market for EVE players to want to play EVE integrated apps, rather than other companies apps, so as to earn some small benefit for their EVE experience whilst commuting, on breaks, bored in lectures etc. Although they will likely be so comically overpowered as to obsolete carriers and dreadnoughts, (Given how brokenly overpowered T3 cruisers are with making battleships almost obsolete.) At least I won't "HAVE" to fly T3 cruisers in non-fleet battles anymore. There'll be more information post CSM summit, plus additional stuff in the run up to Fanfest. We've been closely monitoring Ascension and the transition to Alpha/Omega over the holidays before we dive into work for 2017. Last CSM the CSM pushed hard to get rid of remaps... yet we still have remaps.